Posted by Lorea Thomson on Wednesday, March 19th, 2014 at 11:22am. Spring officially starts this week so swing by and see some “spring training” at Roger Dean Stadium in Abacoa, Jupiter. The Miami Marlins and the St. Louis Cardinals spring train in the striking stadium that was built in 1998. Choose from luxury box seating, or two levels of permanent seating, plenty of parking and delicious concessions offering gourmet options to hot dogs, peanuts and Cracker Jacks. Roger Dean Stadium is the only stadium in Florida to host two major league baseball teams for spring training: Miami Marlins and St. Louis Cardinals. The stadium also hosts four minor league teams: Jupiter Hammerheads, Palm Beach Cardinals, Gulf Coast Cardinals, and Gulf Coast Marlins. All the teams share the main stadium where games are played. However, the teams have their own practice fields, batting cages, pitching mounds and state of the art conditioning rooms. Be sure to catch the “Open Air Market” from 10:00am – 5:00pm, every Wednesday during spring training, in March at the Abacoa Town Center Amphitheater directly across the street from the stadium. Shop from more than 50 vendors offering organic and artisan foods, local arts and crafts, memorabilia and more. 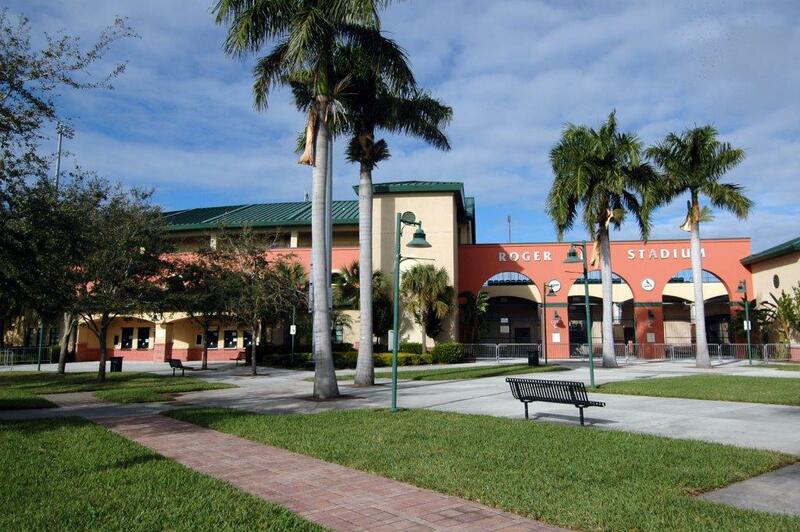 Roger Dean Stadium is located at 4751 Main Street, Abacoa, Jupiter, FL. For information and inquiries about spring season tickets please contact Roger Dean Stadium at 561-775-1818 or visit www.rogerdeanstadium.com.